Human society is of two legged creatures and so everything around them is designed for bipeds. For us, walking seems to be such a simple idea. But it is a highly complex process, where a single step requires us to use nerves signals from our entire body to figure out the position of the foot, the slope of the ground, and the relative location of the rest of the body. The brain then performs numerous calculations in a second to determine how to maintain balance and to have dozens of muscles make tiny corrections to keep one upright. It is of great concern and importance when we are thinking about future of robotics because for robots to assist or replace humans in many tasks, one is looking for a perfect biped movement. It is a matter of pride that three students viz-a viz Mr. Harsh Joon, Mr.Aditya (both from B.Sc. (H) Physics II yr) and Mr. Mridul Jain (B.Sc(H) Electronics, IIyr) raised the bar of robotics club by successfully being able to develop a Bluetooth controlled biped moving robot exhibiting six degrees of freedom. The walking style of humans with perfect balance was replicated and demonstrated in this robot. It is a perfect example of how the students applied mechatronics to achieve this arduous task during summer vacation. Extending this success, our aim is to develop a humanoid which is a complex technological challenge but we at robotics club are very optimistic that students with their innovations and untiring efforts will definitely achieve this. 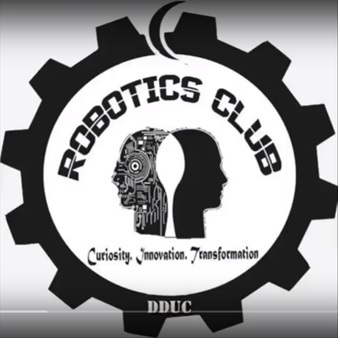 Robotics Club satiates the technological appetite of the techno-hungry students by providing them with an avenue to implement their innovative ideas and in this pursuit a plethora of activities were undertaken by the club. An Orientation Programme was organized in which the fresher’s were provided with a glimpse of various realms of Robotics and were acquainted with various activities of the club. Endeavouring to quench the thirst of automation- loving blossoming minds, the club undertook enriching activities and organised a series of workshops on Arduino Boards. The Club members also participated in e-Yantra competition organised by IIT Bombay. A total of six teams appeared for the online test out of which five qualified for stage 1 and one team comprising of Harsh Joon (B.Sc (H) Physics 1st year), Samarth Chaturvedi (B.Sc (H) Comp. Sc. 3rd year), Mridul Jain (B.Sc (H) Electronics 1st year) and Pawan Kumar Mishra (B.Sc (H) Electronics 3rd year) qualified for stage 2. The jewel in the crown of the Club was added by Praveen Kumar Chaturvedi (B.Sc (H) Electronics 2nd year), Manish Kumar (B.Sc (H) Electronics 2nd year) and Pawan Kumar Mishra (B.Sc (H) Electronics 3rd year) as they secured the second position in the event 'Maze of Theseus' in Invictus, the technical festival of Delhi Technological University. RoFSoc2018: Annual festival named RoFSoc (Robotics for Society) with an aim to offer a platform for the students to display their skills and knowledge in the form of projects made to serve the society was initiated. This year it was organised on February 26, 2018 in collaboration with Secure Computing Lab and School of Computer and System Sciences, Jawaharlal Nehru University. The event was judged by Dr. Jitendra Kumar Verma (Asst. Prof., Galgotia University), Dr. Karan Singh (Asst. Prof. and faculty incharge, SC & SS, JNU) and Dr. B. Chandra (formerly at IIT Delhi). Prof. Ashok Mittal (Formerly at IIT Kanpur) graced the occasion with his presence. Students of Maharaja Agrasen College bagged the 1st and 2nd position and students from Institute of Informatics and Communication bagged the 3rd position. All the winners were offered an Internship at JNU. The hard work of the student conveners of the society, Mr Pawan Mishra (B.Sc Hons. Electronics), Mr. Divyanshu (B.Sc Hons. Computers), Ms. Khushleen (B.Sc Hons. Physics) and all the student members is worth applause. Nine teams qualified the online test conducted by e-Yantra, IIT Bombay. In the final task one team from our collegefinished in the fourth placefor the theme ―Model a Terrain‖. Pawan Kumar Mishra and Praveen Kumar, won the first prize and Pankaj Yadav secured the second prize in the Maze-Runner event conducted by Physics and Electronics department of Rajdhani College, DU. Hitesh Garg won the first prize in theRobo-Raceheld during Inter College workshop organised by Robotics Club of DDUC. Pankaj Yadav bagged the first prize in an event ―Project Effect‖, project based on IOT at IIC, University of Delhi. The Robotics Club organized three workshops conducted by in house faculty members of the club during 2015-16. First, a three-day workshop was conducted on“FireBird V” in the month of August 2015. Other twowereon “Getting started with Arduino”in the months of January andFebruary, 2016 respectively. The workshop activities stimulated the learning of the participants and someexciting projects were built by students afterwards. Five teams from our college were selected for e-Yantra Robotics Competition(eYRC-2016) conducted by IIT-Bombay. Out of five college teams, three teams were in top 15. The college teamwon the second position in the robotics event “Block Warriors” in Techhertz, the annual festival of Department of Physics and Electronics of Rajdhani College, Delhi University. The team members were Manish Abhishek, Mohit Singh both from B.Sc. (H) Physics II year and Pawan Kumar Mishra, B.Sc. (H) Electronics I year. The Robotics club was formed in the college in April’2014 as a part of ‘e-Yantra Lab Setup Initiative’ (eLSI) programme of IIT Bombay. The members: Dr. Ravinder Kaur, Dr. Rajni, Dr. Anju and Dr. Anil participated in e-Yantra teachers competition(eYTC) held at IIT Bombay in April 2014 and won the consolation prize. The club under the convenership of Dr. Ravinder Kaur organized a three day workshop on “Introduction to Robotics” on 26th, 27th and 29th September 2014. The participants were the students of B.Sc (H) Physics, B.Sc (H) and B.Tech Computers and Electronics. This workshop was conducted by the members of the Robotics club; Dr. Ravinder Kaur, Dr. Rajni Bala, Dr. Anju Agrawal and Dr. Anil. The main focus of this workshop was to give an insight to the students about the different applications of robots and use of “Fire Bird V”-the dedicated robotic system based on AVR microcontroller. The students were given an extensive practical training on the different aspects of the Fire Bird-V system followed by interactive session and a quiz. The students gave an overwhelming response and expressed their desire for more workshops to be organized in future. Another two days workshop was organized on “QUADCOPTER” on 9th & 10th January 2015. Dr. Ravinder Kaur and Mr. Ankit Rajpal coordinated this workshop in collaboration with ‘Tryst-2015, IIT-Delhi and RoboSapiens’. 55students attended this workshop, out of which 35 were from our college and rests were from other Colleges and esteemed universities including Ramjas college, AND college, Jamia Milia Islamia, BITS Pilani and Manipal University. This club has provided a platform to the students to demonstrate their knowledge and programming skills in Embedded systems and Robotics. This is evident from the fact that two student teams from the club participated in e-Yantra Robotics Competition(e-YRC) organized by IIT Bombay in which over 3107 teams across India registered and260 teams were selected for participation. Both the teams from our college were selected.